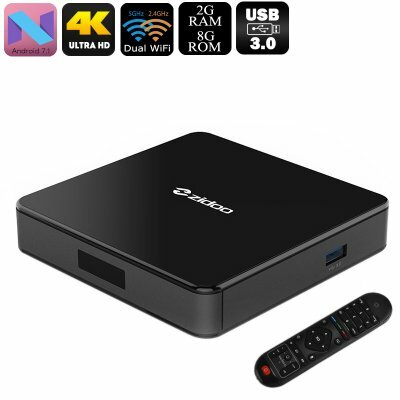 Successfully Added ZIDOO X7 Android TV Box - Android 7.1, Quad-Core CPU, 2GB RAM, 4K Support, Dual-Band WiFi, DLNA, Miracast, Airplay to your Shopping Cart. Within its compact body, this Android TV box packs a sophisticated Quad-Core processor. This chipset has been clocked at 2GHz and is backed up by 2GB RAM. With this hardware at your side, it will tackle the most demanding software without dropping a frame. Thanks to its 64GB SD card slot, this Android TV box offers plenty of storage to keep all your media. Additionally, you’ll be able to stream films straight from the internet thanks to its WiFi support. With Dual-Band WiFi at your disposal, you’ll be able to browse the web at lightning speeds. DLNA lets you easily share files in between your different electronic devices so you’ll always have access to your favorite films and series. The ZIDOO X7 TV Box supports 4K resolution. With its Ultra-HD graphics, it lets you enjoy your sports games and movies like never before. With its vivid color and crisp details, this Android TV box treats you with an absolutely breathtaking visual experience. To increase your user experience even further, it supports Miracast and Airplay. Thanks to these features you’ll be able to mirror all that’s happening on your Smartphone or Tablet onto your 4K TV set. No matter for what purpose you use this 4K TV box, it is sure to meet all your home entertainment demands.